AMD moved the Ryzen Hype Train along a few stations with the release of second-generation models last month. 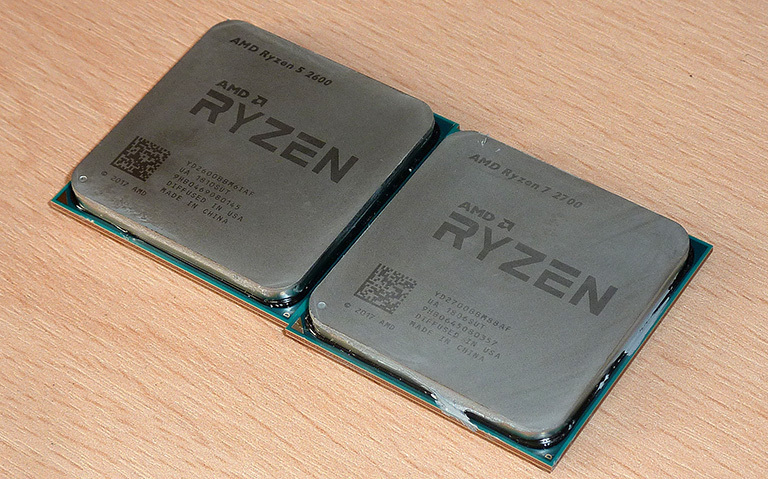 We reviewed the Ryzen 7 2700X and Ryzen 5 2600X and found them to be solid performers, particularly with respect to multi-threaded performance and bang for buck. Though mentioned in the original article, AMD also released the non-X versions of the same chips, so without further ado, let's take a closer look at them. Getting the obvious bits out of the way first, the Ryzen 7 2700 and Ryzen 5 2600 are based on the same Zen+ architecture as the X-designated models. This means they are built on a 12nm process, fit into a plethora of AM4 boards, and run with DDR4-2,933 memory support. IPC is a tad higher than the previous generation mainly due to improvements in the memory-latency department. Overall speeds are higher, too, thanks to the use of Precision Boost 2 technology that better maximises per-core headroom. Continuing the theme laid down last year, non-X chips reduce the TDP to 65W, down from 105W and 95W for the reviewed Ryzen 7 and 5, respectively. That's some wattage to shave off, so potential frequencies are reduced by a significant degree. Keeping inside that 65W envelope requires the Ryzen 7 2700 to pull back to 3.2GHz base and 4.1GHz boost. These numbers don't tell the whole story, however, as the all-core boost, which is the most important metric in defining full-on multi-threaded performance, is likely to be a fair bit lower than 2700X - it has an extra 40W to play with, after all. Ryzen 5 2600 faces the same frequency/wattage dilemma. Its 3.4GHz base and 3.9GHz boost ought to put it reasonably close to the X part in light-load tests but we'll have to wait and see just what it does when running flat out. So who do these chips appeal to? One can make a case for users who want the latest Ryzen goodness in a small-form-factor PC where cooling/heat is likely to be more of an issue. Others preferring a truly low-noise computing experience would do well pairing one of these processors with a massive cooler for near-silent operation. But, of course, the beauty of the Ryzen processors is their unlocked status. Appreciating that all second-generation Ryzen chips are coming off similar production wafers, they should have similar electrical characteristics, enabling you to overclock X and non-X chips to similar levels. Fancy some more oomph? Dial the Ryzen 7 2700 up to an all-core 4GHz with a bit more voltage. That's the theory, anyway. The 65W versions of the first-gen Ryzens also stood out because they were substantially cheaper than the X version. For example, going back to the Ryzen 7 1800X review highlights that the 1700 was £70 cheaper than the 1700X. Such relative bargains are not available this time. As of May 1, both new Ryzens are £25 cheaper than their X counterparts, coming in at £255 and £170. Making the case even harder for the Ryzen 7 2700, it ships with the Wraith Spire LED cooler, not the new-and-improved Wraith Prism LED present in the 2700X's packaging. Ryzen 5 2600, meanwhile, has the same Wraith Spire (non-LED) cooler in its retail packaging. Put simply, the non-X processors are a tougher sell this time around, more likely to be used by system integrators than enthusiasts. Right-o, on to the benchmarks.